In this video, Dr. Huntoon discusses living with Chronic Pain and what can be done to support that condition. Weekly, Dr. Huntoon receives 5 to 10 calls from people who are looking for help with their pain management. In truth, they are looking to renew their prescription, as their doctor is no longer willing to write another prescription for them. Dr. Huntoon has certified in a ground breaking technique called Neurologic Relief Centers Technique found at www.nrc.md. Please go to that site and call us if you'd like our help. 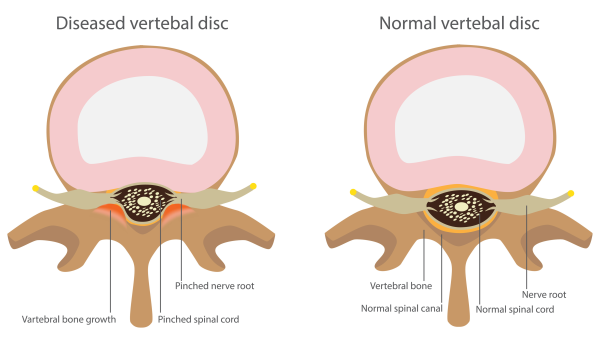 Spinal stenosis is a narrowing of the spinal column that causes pressure on the spinal cord, or narrowing of the openings (called neural foramina) where spinal nerves leave the spinal column. Numbness, cramping, or pain in the back, buttocks, thighs, or calves, or in the neck, shoulders, or arms. Weakness of part of a leg or arm. Often, symptoms will get worse slowly over time. Most often, symptoms will be on one side of the body or the other, but may involve both legs. Symptoms are more likely to be present or get worse when you stand or walk. They will often lessen or disappear when you sit down or lean forward. Most people with spinal stenosis cannot walk for a long period of time. Patients with spinal stenosis may be able to ride a bicycle with little pain. Spinal stenosis usually occurs as a person ages and the disks become drier and start to bulge. At the same time, the bones and ligaments of the spine thickens or grow larger due to arthritis or long-term swelling (inflammation). Lift your legs straight up while lying down. If the pain is worse when you do these, you may have sciatica, especially if you also feel numbness or tingling in one of your legs. Your doctor will also move your legs in different positions, including bending and straightening your knees. All the while, the doctor is checking your strength and your ability to move. To test nerve function, the doctor will use a rubber hammer to check your reflexes. Touching your legs in many places with a pin, cotton swab, or feather tests how well you feel. Your doctor will tell you to speak up if there are areas where you have less feeling from the pin, cotton, or feather. When your back pain does not go away, or it gets more painful at times, learning to take care of your back at home and prevent repeat episodes of your back pain can help you avoid surgery. Your medical doctor may refer you for physical therapy. The physical therapist will help you try to reduce your pain, using stretches. The therapist will show you how to do exercises that make your neck and/or back muscles stronger. You may also see a massage therapist. Sometimes a few visits will help your back or neck pain. Cold packs and heat therapy may help your pain during flare-ups. A type of talk therapy called cognitive behavioral therapy may be helpful if the pain is having a serious impact on your life. This technique helps you better understand your pain and teaches you how to manage back pain. If the pain does not respond to other treatments, or you lose movement or feeling, you may need surgery. Surgery is done to relieve pressure on the nerves or spinal cord. You and your doctor can decide when you need to have surgery for these symptoms. Spinal stenosis symptoms often become worse over time, but this may happen very slowly. People who had long-term back pain before their surgery are likely to still have some pain afterwards. Spinal fusion probably will not take away all the pain and other symptoms. Even when using MRI scans or other tests, it is hard for your surgeon to always predict whether you will improve and how much relief surgery will provide. Dr. Huntoon has great success in remedying this uncomfortable condition. Using the breakthrough technique of NRCT has demonstrated great efficacy in stopping the pain of spinal stenosis. Supporting the person with high quality supplements to reduce the inflammation of the area has always shown to be beneficial. Understanding the specific nature of your condition and the time commitment to helping you is important. Your Holistic Chiropractor, medical doctor and other health professionals will help you manage your pain and keep you as active as possible. Working with a Holistic Chiropractor who has experience with spinal stenosis is the best advice. Many have also benefited from using acupuncture to help their pain associated with spinal stenosis. Call your healthcare provider if you have symptoms of spinal stenosis. Dr. Huntoon has successfully used NRCT to resolve this uncomfortable and nagging health concern. Once resolved, he will instruct you on how to make sure this does not come back by educating you on life-style prevention changes. This proves to be effective in those who have taken this path. Working with a Holistic Chiropractor who utilizes NRCT can lead to full resolution of your symptoms. This is a more conservative approach than what is next. Spine surgery will often partly or fully relieve symptoms. However, people who had long-term back pain before their surgery are still likely to have some pain afterward. Spinal fusion probably will not take away all of the pain and other symptoms. Spine problems are possible after spine surgery. The area of the spinal column above and below a spinal fusion are more likely to be stressed when the spine moves. Also, if you needed more than one kind of back surgery (such as laminectomy and spinal fusion), you may be more likely to have future problems. A lack of feeling can make you more likely to injure your legs or feet. Infections may get worse because you may not feel the pain. Changes caused by pressure on the nerves may be permanent, even if the pressure is relieved.